I thought spring had sprung, but maybe not yet. Here in Chicago this weekend, the river is green and the traffic was horrendous. St. Patty’s Day is a rather large celebration in this fine city. As it would end up, the sore throat I’ve been fighting for days continues to get worse and worse and now I’m uncomfortable and have the voice of a 3 pack-per-day smoker. No St. Patty’s Day celebrations for this girl. Nope, this weekend we’re celebrating my Grannie’s 90th birthday! NINETY! And, she looks fabulous, feels good, and most importantly, is in great spirits, making people smile all the time. If you ever ask Grannie what she wants to eat, she’ll say chocolate. Maybe she’ll say cake, but usually it’s just chocolate. Needless to say, everyone got her chocolate for her birthday. It’s only appropriate to give the woman what she wants! Plus, she’s got this killer figure that at 90, even I’m jealous of. Seriously. My linebacker genes did not come from her, that’s for sure. When you ask my husband what he wants to eat…his response is always pizza. He would happily eat pizza every day, and it doesn’t even have to be good pizza for him to be happy. Despite what he thinks, I do try and please both Mr. Prevention’s preferences and favorites while accommodating the dietitian in me. Pizza every night is simply not an option, but I do enjoy finding slightly healthier ways to enjoy his favorite meal. 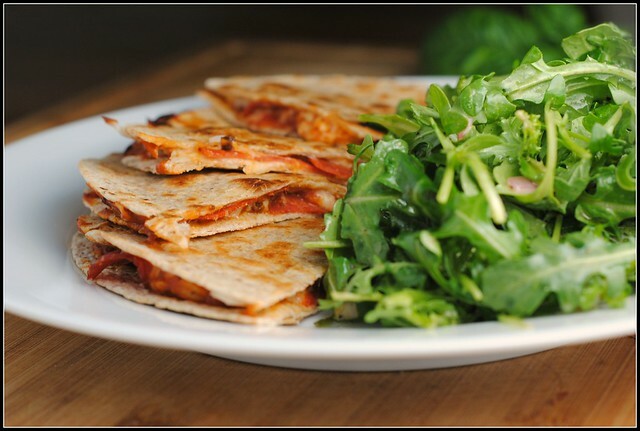 I served this (rather generous in size) quesadilla with a heaping pile of this arugula salad. 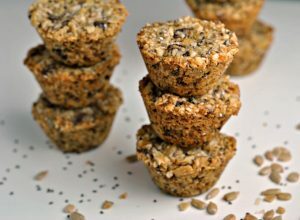 Mr. Prevention was wow-ed and the best part is…even he could throw these together for a quick meal. Feel free to add in veggies, sauteed onions, fresh garlic, herbs, etc. The sky is the limit! Heat a medium skillet over medium heat, or preheat an electric griddle. Spray one side of each tortilla with a mist of olive oil. Arrange half of the tortillas, sprayed side down on the skillet or griddle. Spread ~3 tablespoons pizza sauce on each tortilla and top with cheese and pepperoni. Top with the remaining tortillas, sprayed side up. Cook quesadillas for 3-4 minutes on each side, or until golden brown. Remove from heat and allow to set for 1-2 minutes before cutting into pieces. Sunday: Grannie’s 90th birthday party! Happy 90th to your grandma – that’s wonderful, and that she is still in great shape is icing on the cake! I am with your hubby, I could eat pizza every single day and never get sick of it! 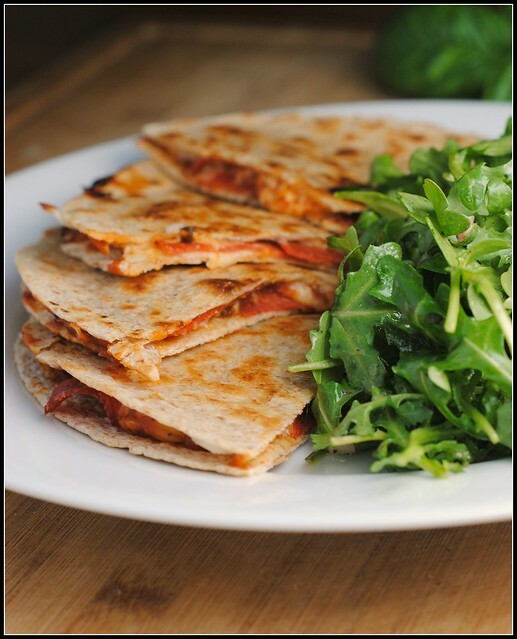 But the pizza quesadillas look amazeballs! Hope your sore throat gets better soon! For a sore throat: gargle straight up with apple cider vinegar (I usually like Bragg’s organic the best), cut a lime in half, boil in water for at least 30 minutes and drink, and go to your local health food store and buy some oil of oregano caps 🙂 Those are the natural remedies I always use that work like a charm! Oh and I loved your menu as always!! Feel better soon! 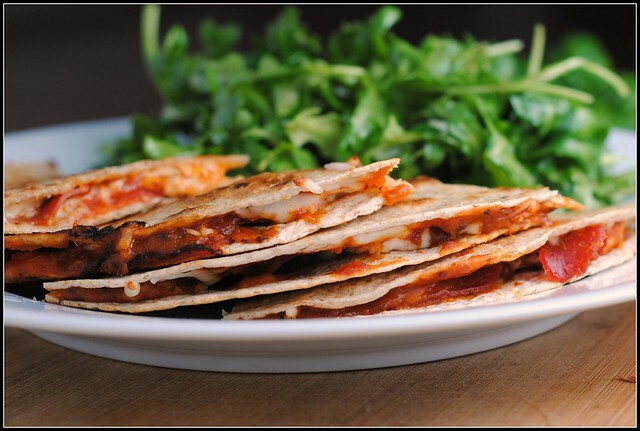 This quesadilla looks fantastic, and extremely easy to make. Your making me hungry and craving that arugula salad again with that awesome dressing. Enjoy your grandma’s birthday, 90…wow! 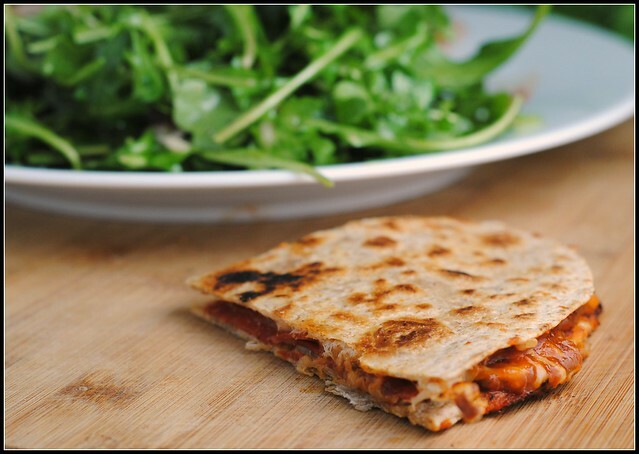 Pizza in a quesadilla – what a clever idea! These look perfect for fixing a quick pizza craving in a healthier way. 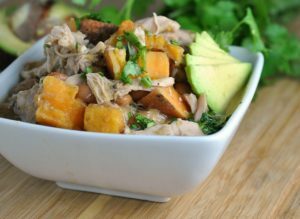 Oh wow yum, this looks amazing! I never in a million years would’ve had the idea to look at things in that light. This will make my life a lot easier.